“Sardines. That was the mystery ingredient in Loretta Foxe’s chocolate cake, and both her children knew it. This particular cake was covered in blueberry icing and had twelve candles on it. It was sitting on the kitchen table in the Foxe family’s house in Oxford. The Foxe family children have no idea its Archie’s birthday, they don’t even know who Archie is, and he doesn’t know them. But when a mysterious package arrives for him on his birthday with strict instructions to take it to a bookshop in Oxford he is packed away to live with them. There Archie will discover that his family has a secret they have kept from him, and its not just that he has more family than just his grandmother. He will discover that magic is real, and that he is to start work as an apprentice at the Museum of Magical Miscellany. And this is just the start of his discoveries. Ok so this book will definitely be compared to Harry Potter by a lot of people, its inevitable. It is about magic, an orphan who discovers magic as a pre-teen and a secret place where magic is taught that humans do not know about. I just wanted to get that out of the way because whilst there are similarities which a lot of people will pick up on… its also a good book on its own merit! The story is fun with lots of twists and turns to keep you on your feet. Its typically a middle grade adventure with what seemed to be quite obvious paths to me but I still loved and think a younger reader will really enjoy. The family relationships was an added bonus with a quirkily extended family who Archie is getting to know as we do. I loved the people Archie met during his time at the Museum and the book has been left wide open for more to come so I am looking forward to meeting them again. The characters within the book all had a kind of eccentric kind of feel to them and I liked that. The dialogue was a little basic, and I think it felt a little wooden in places but the descriptions of the characters and their actions made up for that. I loved Old Zeb and wish he was around for more of the book, and I was intrigued by a few of the other characters, especially the elders. Archie himself seemed to just jump into the story and take it along with him, there wasn’t much of a personality there but he seemed just inquisitive enough to take the story forward, without being stupid enough to propel it forward so fast you weren’t sure what was going on. I would like to know more about the main characters, as in Archie and his cousins, because I get the feeling we’ll be sticking with them. I loved the inclusion of illustrations in the book but as I had a proof copy I’m not sure if they were the final ones. I would love for them to be in colour but I know thats not always a possibility. All in all the book was a great start to a series, there could be some improvements made but the series has real potential and I will definitely be checking out the rest of it when it gets here. 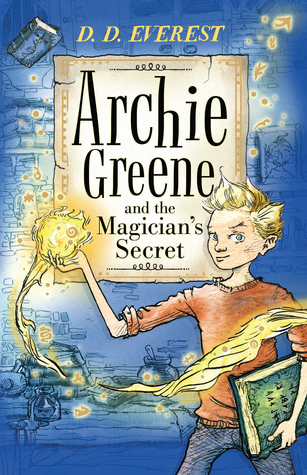 Archie Greene and the Magician’s Secret will be published on September 4th by Faber & Faber. My copy was sent from the publisher in exchange for an honest review.